Jill McLeod reached up and touched the stainless steel diesel locomotive, one of three powerful engines that would pull the train on the first leg of its eastbound run from Oakland to Chicago. She felt the tingle of anticipation, as she always did when she saw the sleek streamliner at the start of a journey. The snub-nosed front of the first diesel was painted orange. Rectangular plates on either side of the big, round center headlight bore the engine number 805-A. The emblem below the headlight was square, with a black background showing the Western Pacific Railroad’s feather logo and the legend Feather River Route. Orange stripes ran down the sides of the locomotive, with Western Pacific in black letters below. “It certainly is.” Earlier, it had drizzled. The moisture in the air curled the ends of Jill’s light brown hair, which she wore in the short, curly style known as a poodle cut. Fog hugged San Francisco Bay and spilled ashore, blurring buildings in the rail yard, and obscuring Berkeley, Oakland, and the hills to the east. The front half of the Zephyr stretched out of the oversized train shed at the end of the Oakland Mole, the huge pier and causeway extending from the eastern shore into the bay. Mr. Wylie was a tall, broad-shouldered man in his mid-forties, clothed in the distinctive uniform of his position. On his billed cap a shiny badge read Western Pacific Conductor, and WP pins decorated each lapel of his dark jacket, worn over a white shirt, tie, and vest. A watch on a chain was tucked into his left pocket. His first name was Arthur, but most people knew him as Red, because of his rusty-colored hair. Not that she would ever address the conductor by his first name or his nickname. Onboard crew members were supposed to keep things on a “Mister and Miss” basis, even though they traveled together often. While on the road, the conductor was in charge of the train. His was the last word. “I’ll have my Christmas with my family when I get back from Chicago,” Jill said. Her holiday celebration would be closer to New Year’s Eve. It was Monday, December 22, 1952. The eastbound California Zephyr, train number 18, was due to leave at nine o’clock this morning and scheduled to arrive in the Windy City at one-thirty on the afternoon of December 24th, Christmas Eve. After a two-night layover, Jill would board the westboundZephyr, train number 17, scheduled to depart Chicago in mid-afternoon on December 26th. Barring any complications, she’d get back to Oakland two days later, on the afternoon of December 28th. Jill lived with her family in the nearby island city of Alameda. Her mother had been teary-eyed this morning, because her oldest child would spend Christmas in a Chicago hotel, away from home during the holidays. So Mom made waffles—Jill’s favorite—for breakfast. Still in her bathrobe, Jill ate with her parents and siblings in their sunny kitchen, pouring hot maple syrup over buttery squares. “We’ll see you when you get back,” he said. Then he headed out the door, for his rounds at the Alameda Hospital, where he was a general practitioner. “I’d better get dressed,” Jill said, gathering up her presents. She went upstairs to the room that had been hers since she’d graduated from the University of California, three years earlier. Sophie, Jill’s calico cat, curled up on the bed, her orange, black, and white face tucked under her white paws. Jill leaned over and stroked the cat’s silky fur. The cat opened her yellow eyes, then took Jill’s hand in her forepaws, kicking gently with her hind paws. Jill tickled the cat’s stomach, and Sophie purred. Then she got up and stretched before curling into a ball again. Jill dressed and put on her makeup. Then she picked up her suitcase and an old carpetbag made of faded blue fabric, containing a few extra items for the trip. “I’m leaving now, Sophie,” she told the cat. “Guard the house until I get back.” Sophie opened one yellow eye and yawned. The brakeman approached them. He was the crew member who assisted the conductor onboard and applied and released handbrakes. He said hello to Jill before turning to ask Mr. Wylie a question. Jill stepped away. She had plenty to do before the train left. She walked alongside the three locomotives. The consist—the rail cars that made up the train—began with these engines. 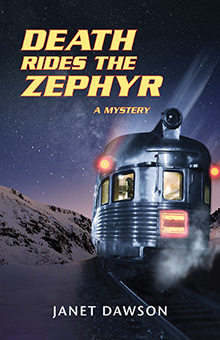 The California Zephyr was the joint operation of three railroads—the Western Pacific, the Denver & Rio Grande Western, and the Chicago, Burlington & Quincy. The cars that followed the engines, built by the Budd Company in Pennsylvania, were a mix of equipment from all three roads, with the exception of the transcontinental sleeper, which belonged to the Pennsylvania Railroad. 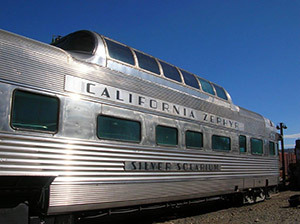 The exterior of each car had the legendCalifornia Zephyr centered over the windows, and below the windows, the individual car’s name. The sparkling, newly washed stainless steel cars, all with “Silver” in their names, gave the train its other title—the Silver Lady. The baggage car, the Silver Stag, was coupled to the third locomotive. She waved to the baggage man, who stood near his folding desk and equipment locker. Then a long black hearse drove slowly up the platform and parked with its rear doors facing the baggage car’s double doors. Two men got out of the vehicle and opened the hearse, revealing four coffins inside. The baggage handler jumped down from the car. The men consulted over the paperwork. Then the baggage man wheeled over the special cart that raised and lowered, especially for loading coffins in the baggage car. The men from the funeral home began unloading the coffins onto the cart, preparing to transfer them to the train. Jill took a deep breath and held it for a moment, then expelled air in a sigh. A week earlier, the McLeods’ neighbors in Alameda had been overjoyed when their son, a soldier in Korea, had been discharged and sent home, arriving in time for the holidays. These servicemen were going home as well. But they were making their final journey in the train’s baggage car, their coffins covered with American flags. How sad to lose a loved one during the holidays, Jill thought. How sad to lose someone you love at any time of the year. The cars with Vista-Domes had what was called a depressed floor under the dome, lower than the rest of the car, with two steps on either side leading down to this level. On the chair cars, the men’s and women’s washrooms were here, under the Vista-Dome, each with toilets and sinks for the coach passengers. Inspecting the women’s washrooms in the public areas of the train was part of Jill’s pre-departure routine, so she stepped inside and looked around, finding the washroom clean. Another part of her routine was putting up her name cards, which identified her as a member of the crew. She took a card from her skirt pocket and slipped it into the holder on the wall. Then she greeted the coach attendant and left the Silver Pony, heading back to the second car, the Silver Palace. This car was slightly different. It contained the conductor’s office, a compartment at the right side on the rear of the car, with a bench seat and a desk. She said hello to the coach attendant for the Silver Palace, then checked the washroom and placed her name card, repeating the actions in the third chair car, the Silver Saddle. Then she entered the Silver Hostel, the buffet-lounge car. At the front of the car she glanced into the washroom, finding it clean, as she expected. She kept walking down the central aisle of the car’s coffee shop, which served hot food, snacks, and beverages. The passageway jogged to the right and then left, down the steps and running alongside the wall of the lounge. Jill greeted the steward, who was behind the bar, checking glassware and bottles, ready to dispense beverages, both alcoholic and non-alcoholic. Behind him was a small kitchen. Just beyond the entrance to the lounge were another two steps up, then a curved staircase led up to the Vista-Dome above the lounge. At the foot of the stairs, on Jill’s left, a closed door led to the crew dormitory, with space for fifteen crew members, bunks stacked three high, lockers, and a washroom with toilets and showers. Jill’s compartment was at the end of the car, next to that of the dining car steward. The narrow space contained a bench seat that folded down into a bed, a toilet, and a washstand that was pulled down from the wall, then pushed up again when not in use. This served as her quarters for the two-and-a-half-day journey to Chicago. Earlier, she had stowed her suitcase and the blue cloth bag, along with the first-aid kit she’d picked up when she’d arrived at the rail yard. Jill went through to the dining car, the Silver Plate, and stepped into a hive of activity. Crew members had arrived before dawn, loading supplies from the commissary building into the diner before the train was moved from the yard to the Mole. The pantry was packed with a vast array of food and beverages, enough to feed passengers and crew on the train’s eastward journey to Chicago. The train carried crockery, glassware, silver service and kitchen equipment, and linens. Now the Zephyr’s chefs were in the diner’s stainless steel kitchen, menus planned, ready to prepare those meals. Jill walked down the passageway that ran alongside the wall of the stainless steel kitchen and pantry, where chefs in white uniforms, aprons, and caps were already preparing for lunch. In the dining section, six waiters in white uniforms had covered each of the tables with fresh white cloths and set them with Western Pacific china, heavy silverware, and glasses. Each table held a full water bottle, a stainless steel stand holding the menu, and a bud vase containing a red carnation and, in keeping with the holiday season, a spray of holly. Now they talked among themselves as they waited for departure. Marcus Gridley, the dining car steward, looked up from his curved counter in the center of the car. The base of the counter was decorated with a mural of carved linoleum, showing an auburn-haired woman in Grecian draperies, seated in a pastoral scene, a bunch of grapes in her hand and more grapes in the basket on her lap. Jill walked back through the Pullman cars—the Silver Gull, the Silver Palisade, the Silver Pine, and the Silver Rapids—where the sleeping car porters were giving the accommodations one last inspection before the passengers arrived. In each car, she greeted the porters and placed her name cards in the wall holders. The last car in the train, the Silver Solarium, was an observation-sleeper, with three double bedrooms suitable for two passengers each, as well as a drawing room that could accommodate three people. All four accommodations had enclosed toilet facilities. Todd Parsons, the porter, wasn’t in his tiny compartment at the front of the car, opposite the electrical locker and a toilet. Jill walked past the bedrooms and took two steps down to the depressed level under the Vista-Dome, where a glass partition looked in on the car’s buffet, which provided beverages and a limited menu during the journey. 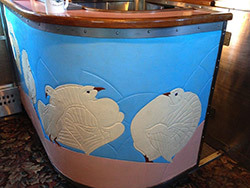 Mr. Parsons was in the small bar, his reflection visible in the mirror etched with a design of birds and branches. The curved counter where he stood was similar to the one in the dining car, with a carved linoleum base. This mural showed plump white birds on a sky blue background. “Good morning, Mr. Parsons,” Jill said. The “specials” were “special attention passengers,” usually prominent people who had come to the notice of the railroad when they’d booked their accommodations. As such, they were singled out for extra attention from the crew. These passengers might be traveling anywhere on the train; for this trip, the people in question were all traveling on the Silver Solarium. According to the information Jill had received when she’d checked in this morning, three of these passengers would board the train here at the Oakland Mole, after arriving on the ferry from San Francisco. The other four would board in Oakland, at the Western Pacific station at Third and Washington. “I’ll be back to meet the passengers once we get underway,” Jill said. She walked up two steps to the main level, past a small water fountain tucked into a space at her left. Here another set of steps led up to the car’s Vista-Dome. These stairs curved slightly, and were edged with Lucite that glowed at night with muted lighting. In the lounge, comfortable chairs upholstered in sandalwood and brown—five on one side and four on the other—ranged along the sides of the car, which had a rounded end known as a “fish tail.” The flowered carpet was tan and beige. Venetian blinds and curtains covered the windows on either side of the car. In the middle of the lounge, within reach of passengers who would sit there, were small, round metal tables with recessed holders for glasses around the perimeter and ashtrays in the middle. At the very back of the car, two settees, each wide enough for two people, faced the car’s rear double door. On either side of the door were two small tables built into the sides of the car, just big enough to hold a glass or two. The table on the right held a silver tinsel Christmas tree, about eighteen inches tall, decorated with red and green glass balls and a gold star. Both this lounge—and the Vista-Dome at the top of the stairs, with seating for twenty-four people—were available for the use of all the sleeping car passengers. Just to the right of the stairs a writing desk held stationery and postcards for the passengers’ use, as well as newspapers for them to read. Multiple copies of the San Francisco Chronicle and Examinerhad been delivered to the train before it left the coach yards. The papers were distributed through the cars, including this one. Jill glanced at the front page. The largest headline was about an explosion at a chemical factory in Japan. There was also a photo and article about the opening of the new Broadway Tunnel in San Francisco the day before. Evidently sightseers had turned out in droves. She picked up the Chronicle and leafed through the first few pages. The death toll in that terrible plane crash had gone up to eighty-six. Two days earlier, on December 20, an Air Force C-124 cargo and troop transport plane had crashed at Larson Air Force Base in Moses Lake, Washington. Most of the passengers were Air Force personnel from Korea or Northwest bases, catching a ride home for Christmas in a program called Operation Sleighride. Their poor families, she thought, remembering the coffins being loaded onto the baggage car. She turned the pages of the newspaper, scanning the articles. On page 8, in the upper right corner, she saw a headline. Police Bar Rosenberg Rally at Sing Sing. She read through the article. A delegation of over seven hundred people seeking clemency for Julius and Ethel Rosenberg had traveled by train to Ossining, New York, site of Sing Sing Prison. But the local police had kept them from marching to the prison. Instead, they’d marched near the train station. The Rosenbergs, charged with passing atomic secrets to the Soviet Union, had been convicted and sentenced to death in the spring of 1951. In October 1952, the United States Supreme Court had ruled against reviewing the case. Now the couple’s execution was set for the week of January 11, 1953. “Lots of folks think they are guilty.” Jill recalled the discussions her mother and father had had on the subject. Certainly those hundreds of people who had gone to Sing Sing yesterday thought the Rosenbergs were innocent. She turned the pages, until another headline caught her eye. This one was an editorial. No Romance in Modern War. Jill closed the paper and put it back on the writing desk. She didn’t think there was ever any romance in war. Jill had things to do. The passengers would be arriving soon and she wouldn’t have a moment to relax until the train was well on its way. She placed one last name card in the wall holder. Then she returned to the Silver Solarium’s vestibule and stepped down to the platform inside the huge, echoing Oakland Mole, where the train waited for its passengers. She walked to the rounded end of the observation car, where a small rectangular sign stood out on the car’s stainless steel skin. California Zephyr glowed in yellow neon letters against an orange background showing a drawing of the Golden Gate Bridge. A group of Red Caps, the railroad station porters who wore distinctive red headgear, waited for the onslaught of arriving passengers. They gathered around a radio playing what some people called race music, but Jill knew it as rhythm and blues. She recognized the song, Ernie Andrews singing “Pork Chops and Mustard Greens.” Her brother Drew loved R&B and ever since the record came out last year, he played it constantly. Then voices drowned out the music, echoing off the Mole’s high roof. Passengers from the East Bay cities had the option to board the Zephyr here at the ferry terminus, or at the train’s first stop, the Western Pacific station located at Third and Washington in Oakland. People had already arrived here by car and bus. Jill saw men in Navy uniforms, not surprising with the Naval Air Station located in Alameda. An officer in dress blues approached, walking arm-in-arm with a red-headed woman whose knee-length blue coat matched his uniform. Behind them, a little blond girl dawdled, clutching an overnight case and a teddy bear. A young sailor in bell-bottomed trousers hurried past Jill, carrying a duffel bag on his left shoulder. He saw the officer and stopped, snapping a salute. The officer returned the salute and the sailor continued toward one of the Dome chair cars. Out on San Francisco Bay, a foghorn bellowed its warning. A moment later, Jill heard another horn, signaling the approach of the double-decker ferry from San Francisco. She quickened her pace and walked to a spot a few yards beyond the end of the Silver Solarium. Here she joined the Pullman conductor, Mr. Alford, who supervised the porters and had overall charge of the sleeping cars. The porters were employed by the Pullman Company rather than the railroads. Now, as the passengers arrived, he would check in those with sleeping accommodations, while Jill greeted people, providing assistance and directions as needed.